This is the other side of the cup. 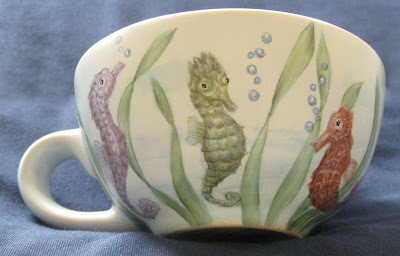 Now that I look at it, it would have been fun to paint each seahorse's bubbles the color of the seahorse! When painted, the paint just sits on the surface of the porcelain until it is fired or cooked in a kiln. Depending on the kind of china and the color, the kiln is fired to a range of temperatures. As the pieces are fired the colors sink into the glaze and become part of the china. Just a little porcelain painting lesson for you.